Published timers will appear on your website and unpublished timers will not. There are two ways to publish and unpublish timers. Published and unpublished timers appear differently on the dashboard. Published timers have a pretty blue-purple gradient bar on their left edge and show metrics on the right, indicating total lifetime clicks (if they have a link) and views. If they're unpublished, they feature a grey bar on the left, grey text, and in lieu of any metrics on the right, a message staying they're unpublished and will not appear on your store. To change a timer's publish status, you can hit its "…" button, next to its EDIT button. Clicking "..." will open the actions menu, listing a handful of convenient actions. If the timer is already published, then the first action you see will be Unpublish. If it's already unpublished, it will be Publish. Clicking it will either make it go live or go dark on your store. Publishing and unpublishing timers can also be accomplished in the editor. To open the editor, hit the EDIT button on the timer you wish to change the publish status for. With the editor opened for your timer, you'll find the publish option at the bottom-right corner of your window. You'll notice that publishing is actually split into two actions: an On/Off switch and a Save or Publish button. If your timer is unpublished, you will see an Off switch and a Save button. This indicates that if you make any changes to your timer in the editor, you will simply be saving your changes, not publishing them live to your store. To publish your timer, you hit the Off switch to turn it On. 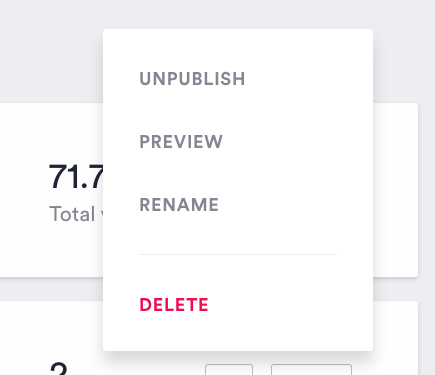 You'll notice that this turns the Save button into a Publish button—we also gave it that same blue-purple gradient you'll find on your published timers on the dashboard. If you wish to unpublish your timer, you simply hit the On switch and hit Save so you don't lose any of your timer settings.